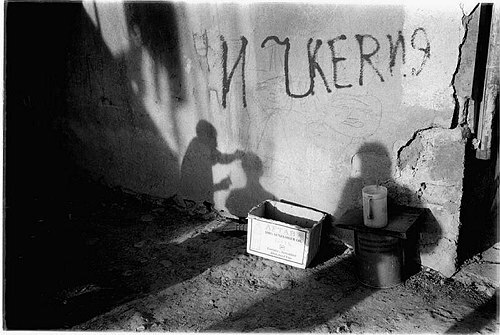 Description: Chechen hairdcut, with on the wall the writing of Ihkeria, the south part of Chechnya who wants to split up Chechnya as a possible solution to the conflict. During period , Chechens have been using the Georgian area of the Pankisi valley as a fall back base for their war inside Chechnya, training recrutes and medical assistance were all possible because the Georgian government was not able to control the area. Since a few month's this has chanced, because Russian pressure forced the Georgian Government to take steps with Russia's assistance. After this decision life has totally changed for the Chechens, most fighters have left and the thousands of refugees from Chechnya who are still there, experience the Russian/Georgian cooperation the hard way. Man are being arrested and questioned , if they show up at checkpoints, and road blocks seal the valley from Georgia as well as Chechnya. Georgian locals are close with Chechens and don't want to cooperate with Russian secret police, who they see as their enemy, but the many soldiers from Tbilisi are in control of the area.